This is the second week in our study on lines and this week we are focusing on vertical, horizontal, repeating or patterned lines. It has been a very cold week in Minnesota; with temperatures hovering around zero. 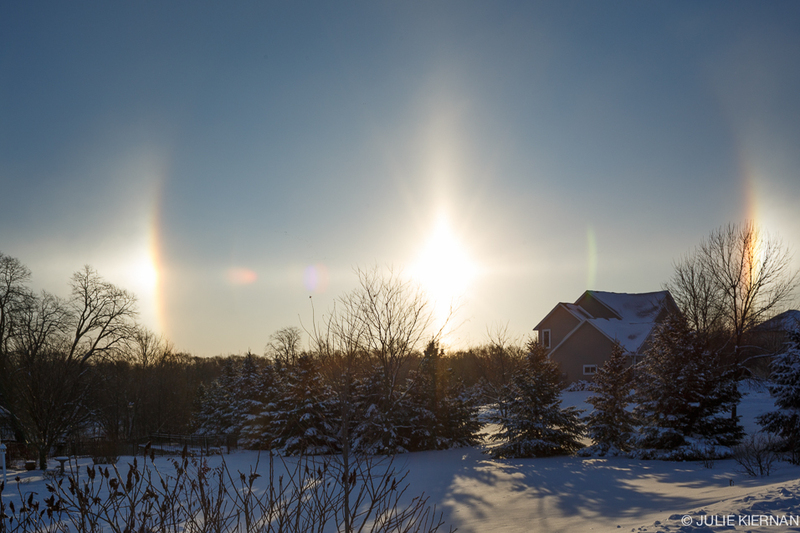 On my way into town, I spotted these sun dogs, or colored patches of vertical lights, on each side of the sun. I rushed back to get my camera and in order to capture them before the light changed. Because I was using a wide lens (28mm), I got some distortion in the lines, but I really like the effect. Please continue to our website to see all of our interpretations of lines in a beautiful mosaic format by clicking HERE. You may click on any images in the mosaic to go to the individual photographer's blog post. For the curious here is a Wikipedia link to information on sun dogs.